After years spent being irresponsible and reckless, Jason Cummings, the new Duke of Rayne, has decided that it’s time to marry, because it’s what comes next. Finding a bride should be easy, right? Not so much. He gets cornered, followed, and even locked in a storage room by all sorts of silly girls. And then on his way in to his man-only haven, the Historical Society, he gets jabbed in the nose by yet another female. But Miss Crane isn’t like the other females he’s dealt with. Winnifred Crane is at the Historical Society to hopefully gain entrance and obtain membership, despite the fact that there are no women members. She has a letter of recommendation from her recently deceased father, who was an Oxford professor and a dear friend of the head of the society, Lord Forrester. While trying to elude her cousin, George, she bumps into the Duke of Rayne. Her papers go flying and her important letter lands in the fountain...and is ruined. George, who has wanted to marry Winn for years, is attempting to stop her from entering as he sees it as a disaster. Winn finds unexpected help in the form of the red-headed duke. Jason takes up Winn’s cause and helps her inside because he feels responsible for ruining her letter and also because he senses an adventure (which he has missed since becoming the responsible duke). When Winn boldly announces that she is none other than C.W. Marks, a brilliant scholar who has published three thought-provoking articles, the men are stunned...and frankly, do not believe it. They think that her father was the author since the articles suddenly stopped after his death—when in fact, Winn needed time to grieve. So, Winn sets out to prove her claim by stating that a famous painting by Albrecht Dürer was actually painted by someone else and that she can confirm it through letters. The only problem is, to get the letters, she would have to travel to Basel, Switzerland...or so she tells George and the others. Jason is charged with escorting Winn, George, and Winn’s aunt to Dover so they can board a ship to Calais. It isn’t until Jason is leaving that he notices Winn is on the wrong ship. When he goes on board to warn her, he finds himself on the way to Hamburg...and the adventure of a lifetime. 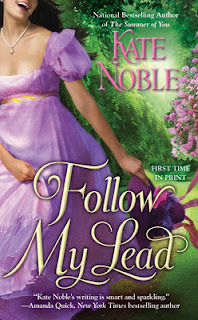 Follow My Lead is another winner from Kate Noble! With one book (The Summer of You), she became an auto-buy author for me. With this book, she has become one of my favorite historical authors. Her books contain everything I look for in a historical romance—sparkling wit, tender emotion, and characters that come alive on the pages. Jason has matured since the previous book and has grown into quite the dependable man. Becoming the duke has helped him turn from selfish to selfless and it shows in his actions. Though he still longs for a bit of adventure and gets that and more while traveling with Winn. When they had begun this together, when he had touched her hand in the breakfast room before they reached Dover, the electricity that passed between them was pleasantly shocking. Intriguing, too. After taking her hand in the coaching yard, he had consciously decided to try and touch her again, on the hand, on the back of the neck, wiping beer from the end of her nose, to see if that curious shock that spread through his nerves would still be there. But now, mere days later, those little jolts, those little touches, they were like a drug to him. Something he needed to have in his system, daily. Something that kept his side warm, and the cool air from invading the space. He just couldn’t stop doing it. Jason is very protective of Winn and I enjoyed watching her flourish under his attention on their journey. She is incredibly smart, but has been sheltered for much of her life—spending most of her time either in a library or taking care of her father—so this is new territory for her. Their romance builds slowly as they get to know one another as friends before it develops into something more. This “on the road” romance has so many great scenes, but it’s the one at the very end that had me tearing up. It was absolutely perfect and endeared me to Jason for life. If you long for beautifully written, top-notch historical romance, look no further than Kate Noble. She may only release one book a year, but believe me, with romance this good, they are certainly worth waiting for! Great review, Andrea. I just discovered Kate Noble last summer and have enjoyed reading her books; they are hard to find, though. I look forward to this book and have added it to my TBB list. 'Follow My Lead' looks like a wonderful read. Great review thank you. "It isn’t until Jason is leaving that he notices Winn is on the wrong ship. When he goes on board to warn her, he finds himself on the way to Hamburg...and the adventure of a lifetime." LOL LOL LOL I have to read this one. Great review! Great review Andrea I have not yet read any of Kate's books I need to change that and add some to my must have list. Andrea, your review has me even more excited for this book than I already was. The Summer of You was my first book by Noble and I fell in love with her beautiful writing. Can't wait to read this one! Thanks, Antonia! Poor Jason goes through the wringer, but it all works out. ;-) I hope you enjoy it! Oh, Helen, if there is one historical author that you NEED to be reading, it's Kate Noble. Her books are "good stuff"! Me, too, PJ! I adored THE SUMMER OF YOU and I know you did, too. I know you'll love FOLLOW MY LEAD! Love the review, Andrea! If I weren't already sold on Kate Noble's books, the red-head hero would have persuaded me. I'm really looking forward to this one! Thanks, Janga! Red-headed heroes are rare like a precious gem. *g* I hope you enjoy Jason and Winn's story! Thanks, Lisa! How lucky for you! I bet you had a great time. Was it at Lady Jane's? I'd love to go there one of these days. I met Kate at RWA last year and was a bit tongue-tied. LOL I can promise that you would love her books! Great review! I have not read Kate's books yet but will start looking for them. This looks really good. Can't wait to read Jason's story. She's a favorite author for me too since Revealed and The Summer of You, highly recommend. Thanks, Virginia! I hope you enjoy it if you pick it up! This sounds like a delightful book and one I am sure I will enjoy. I love "road" stories. It changes the normal dynamics and rules tend to get bent. This is one I will definitely be looking for it. librarypat, if you love "road" stories, you will surely love this one. Enjoy! Laura Lee Guhrke Is Da Biz!